PocketWizard technician and Sports Shooter Academy faculty member Ian Ray told us among other things "The new 6.4 Canon / 3.4 Nikon release has some performance gains in regards to HyperSync. We made some adjustments to the algorithms on a per-camera basis to get some sync timing gains (less banding on some cameras), and also added some time to the HyperSync slider so that you can adjust backwards a little bit farther." The major update is to the company’s ControlTL firmware for the MiniTT1®, FlexTT5®, PowerMC2 and PowerST4 radios and minor updates for the Plus® III and MultiMAX® radios. The Plus III and MultiMAX radios also have new firmware. The new firmware for the Plus III resolves some minor bugs. The MultiMAX firmware, which has been available for a while in beta, adds two new features. 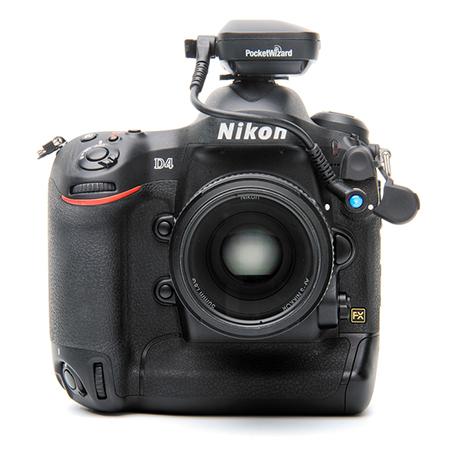 The company also announced a cool new product the Nikon Power Cable (PW-DC-N10) for use with the PocketWizard MiniTT1 Transmitter, the Plus III and MultiMAX (version with USB port) Transceivers and any Nikon Digital Single-Lens Reflex camera equipped with a Nikon 10-pin remote terminal. This cable provides a PocketWizard radio, mounted in the camera’s hot-shoe, the power it needs to operate from the camera.